As an alternative to expensive, invasive, and sometimes dangerous surgical and cosmetic procedures, herbal breast supplements can provide all-natural breast enhancement, lifting, and even cup size growth. Profemme is one of these herbal supplements intended to be a solution for those who don't want to, or cannot afford, going under the knife. Like many herbal breast enhancement supplements, Profemme claims to give results in as little as 30 days, breast firmness in as little as 90 days, and growth of 1-2 cup sizes within 3-6 months. What makes Profemme unique, though, is its claim that its all-natural ingredients only target the breast tissue itself, which could make it potentially an effective way to noninvasively focus on the chest area without disrupting other parts of the body. The cost of Profemme begins at $79.99 for a 2-month order. The Profemme website does not offer a 1-month supply at purchase. Profemme is an all-natural herbal supplement, and the company vows that Profemme contains no synthetic additives or fillers. 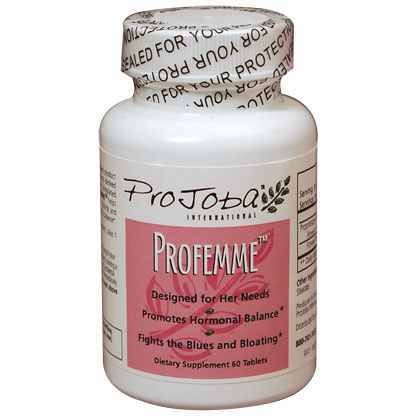 Profemme contains phytoestrogenic plant parts like Wild Yam Root and Fennel Seed, which are a rich source of plant estrogens which can mimic the activity of estrogen in the body. Profemme also contains Saw Palmetto, which helps to halt androgenic activity in the body, making the estrogenic and hormonally balancing herbs in Profemme more effective at inducing breast enhancement and cup size growth. Three times per day, take 1 Profemme capsule, preferably with a meal and 8oz. of water. Do not take more than 3 pills per day, as it will not speed up breast enhancement, and may even cause harmful side effects to the body. The marketers of Profemme recommend the users take the product for at least 3-6 months in order to see significant changes in breast firmness, enhancement, and growth. Profemme's formulation is similar to other herbal supplements for breast enhancement which have been reported to provide gradual breast lifting and growth to some users who have consistently used those products. However, Profemme's website is less than impressive - Almost concerning, actually. The ingredients list shows only the active ingredients, and only identifies what about half of them do, while the other half is left incomplete. There are no testimonials available on the website, nor area for comments, to display any customer response. A 1-month supply can not be purchased: The minimum is a 2-month supply. Profemme claims what sets it apart from other herbal supplements is "Superior customer service." At the bottom of the FAQ page reads the statement, "Profemme is 100% safe." Whether or not Profemme is an effective product, which is unknown from site response, the website is obviously incomplete and filled with errors, and a lack of information, that speak of a sketchy company at best. There are much more accessible products with proven herbal formulations that can instead be considered for an alternative, all-natural way to enhance and grow breasts.